While on holiday in Byron Bay, NSW I was walking around with my new lens and spotted this guy hopping around. He seemed almost tame and very very curious about anything that moved near him. That is a common as mud, Australian Magpie. Out in the west they are apparently all black, but everyone else they are white and black once they are mature. Juveniles start off grey and black like you can see in this shot though. That is an interesting bird PlatinumWeaver and a good shot of it. I'm glad you responded to Eric CAN with the name of the bird because I never would have been able to guess what it was - I don't know Australian birds. 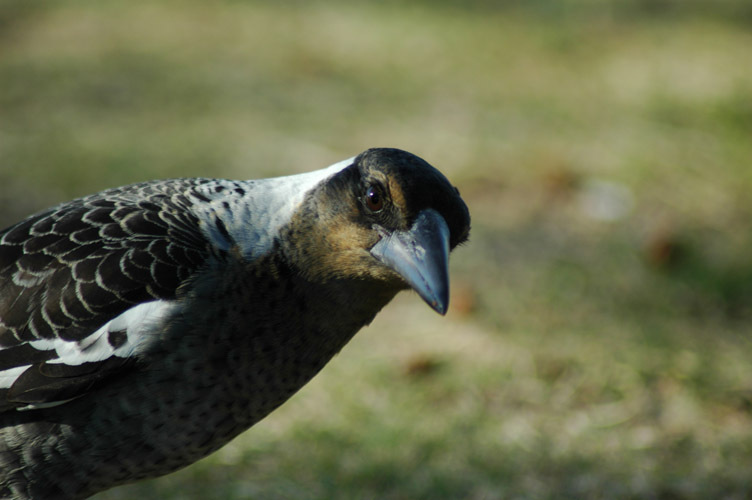 However, the page you posted the link to does show a picture of the adult bird and it has a close resemblence to the North American version of the Magpie. Wich lens did you used?? And how far awayhad you been? Really nice and funny pic. That was with my brand new Tamron 70-300 F/4-5.6 LD that I was discussing in a thread a few weeks ago. Very cool looking bird, and absolutely unique pose! It needs a touch of sharpening to my eye, but other than that, superb photograph.